Calista Flockhart is the latest name officially attached to the CBS Supergirl. The Golden Globe-winning actress has been cast as Cat Grant! Flockhart, most well known from Ally McBeal, Brothers & Sisters, and being the lucky woman who captivated Harrison Ford, will portray Cat Grant as a “self-made media magnate and founder of CatCo” where Kara/Supergirl is her assistant. My first thought: Ohmygod, it’s going to be a superhero Devil Wears Prada, isn’t it? Fun fact: Meryl also has Kryptonian x-ray vision. While Flockhart doesn’t have the gravitas of Meryl Streep — because, honestly, who freaking does? — she is a TV heavyweight that I’m hoping is a grounding, possibly combative, and antagonistic, force to be reckoned with among a relatively unknown-ish cast. What does this casting choice mean for Cat Grant’s characterization in the new series, though? In the earlier Superman comics, Cat Grant is a Daily Planet journalist who dated Clark Kent. Initially disliked by Lois Lane, for obvious reasons, Grant eventually gains Lane’s respect as a reporter. This version of Grant is also a reformed alcoholic who had lost a young son. Alright, I could see this for Ally McBeal: she started from the bottom, now she here — CEO and Founder of her own company. I wonder if this means that she’ll rub elbows with some other company heads that we know, namely Oliver Queen or Ray Palmer. Cat Grant received a personality reboot in Action Comics when she returns to Metropolis. She is depicted as flirtatious and provocatively dressed, in addition to confidently displaying her… two new additions. This sexualized treatment of the Cat Grant character can also be seen in Lois & Clark: The New Adventures of Superman where Grant often tried to seduce Clark Kent during the show’s first season. Smallville took a different approach to Cat Grant’s characterization… twice. In the ninth season, Cat Grant the accomplished Grad Student and Peace Corps member who goes on a blind date with Clark Kent. 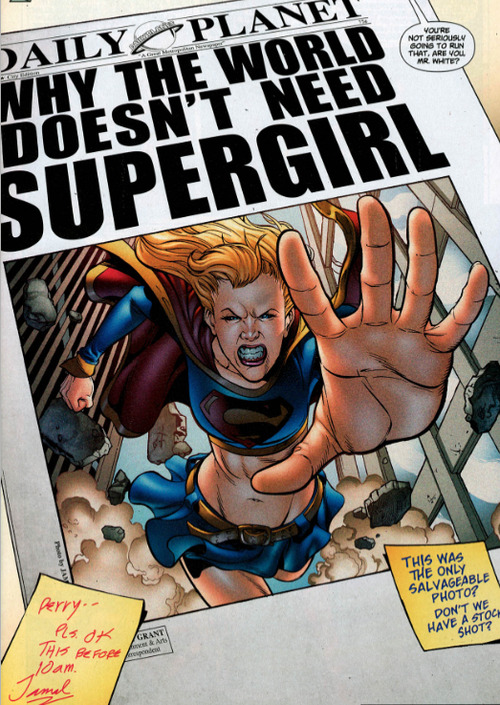 In the tenth season, however, a young woman (who changed her name to “Cat Grant”) becomes Clark’s new partner at the Daily Planet; she is depicted as morally and politically conservative, as well as annoyingly stubborn and pushy. Cat Grant: side character used to challenge the Clark/Lois dynamic. Now, it is my understanding that Cat Grant is going to be a significant role in this new show, otherwise why bother pulling Calista Flockhart off of her TV hiatus? A shallow, oversexualized airhead won’t fly as a main character; neither should such a character be a believably successful business woman. Both television versions of Cat Grant (on Lois & Clark and Smallville) were only present for one season; superhero audiences don’t respond well to underdeveloped, shallow renderings of people. With Flockhart playing the part, the focus, most likely, won’t be on Grant’s physical “assets,” thankfully, and more on her relationship with her assistant Kara, her status as an influential media magnate, and anti-vigilante (or pro-vigilante) stance once Supergirl is established. I don’t think we’ll be getting this scene in the pilot. I’m also interested to see Cat Grant in a Superman-less setting. Usually, Grant is utilized as a means of disrupting Clark Kent’s and Lois Lane’s relationship. Without the Daily Planet and the star-crossed lovers around, maybe she can be turned into a female character of agency? The most obvious route I can see them taking is making Cat the ball-busting lady boss: she’ll be hard on Kara and possibly even demeaning. Maybe she’ll make fun of her glasses and her mild-mannered appearance! Personally, I’d love to see Cat Grant as a mentor to Kara. I would like Kara to look up to her boss and value her advice and support, and, hopefully, set up a multi-dimensional relationship when Supergirl goes public (eventually) and Grant rallies against her like in the original Supergirl story. This casting feels like good news to me; Flockhart’s quirkiness, comedic chops, and charisma, make her a strong choice for Berlanti’s latest superhero venture. I’m happy Jimmy Olsen isn’t the only character getting a makeover. That’s quite a promotion. I was worried we’d get the version who’s lost her only son to the serial killer, the Toy Man.